I mentioned in the previous post that we were going to watch the 1939 version of The Wizard of Oz this weekend. Well, the kids LOVED it! I mean really really loved it. 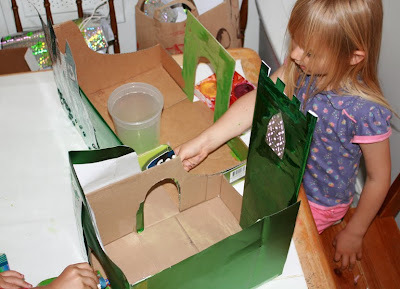 I thought we could try hacking together some sort of play set from the stuff we already have around the house, so that they can play make believe in their own little land of Oz. 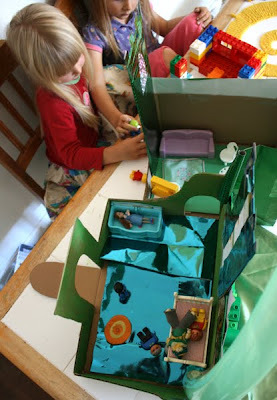 You've probably noticed from some of our older posts like the Train table, the mermaid kingdom, dinosaur island, pixie hollow and more recently Care-a-lot, that my children are very much into making little worlds for their toys to play in. I'm all for encouraging this, because it makes for some very very cheap toys, and I think they get a lot of empowerment from making their own play things. It's nice that their first instinct is to want to build a specific place, rather than find out if there is one that could be bought. It might seem like a lot of work to facilitate this sort of project, but in reality it's pretty easy to just hack together stuff that you have around the place anyway. Sometimes you just have to think sideways to pull it off. This time we started with making the characters for the story. The first ones we made were the easiest. 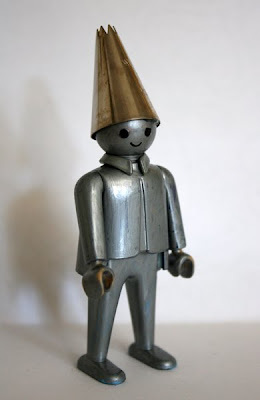 The tin man was a playmobile dude, coloured with silver sharpie and with a metal frosting nozle glued to his head. Three of the characters were made by altering Polly Pocket dolls. My kids love Polly Pocket dolls, and I have to admit they are quite cute despite the ridonkulous Alley McBeale head to body proportions. I hate the fiddly rubber clothing though! and who the heck owns rubber pajamas anyway!?! So it was somewhat of a relief when my mother inlaw bought the girls these strange mix and match Polly Pockets for Christmas, that you can snap together predressed body parts with. Much easier for them to play with at this age, although I do still get freaked out when I find rogue decapitated shrunken heads in odd places around the house. We were able to snap together the most suitable Polly Pocket bits to make Dorothy and the wicked witch. 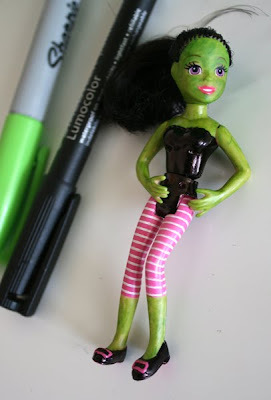 We coloured the witches skin green with a sharpie, and used a fine tipped black sharpie to colour her shoes and clothing. I loved that she had purple eyes and stripey tights already! 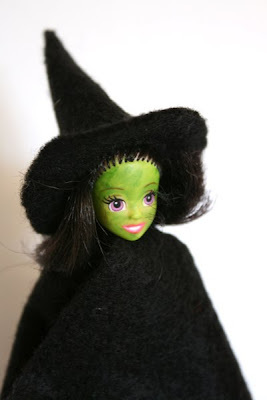 I made her a little felt hat and cape, because otherwise she looked like a halloween stripper witch. 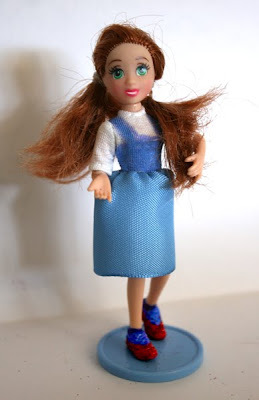 Dorothy was another polly pocket, with a white top that we coloured the bodice in blue sharpie and made a little blue skirt for. 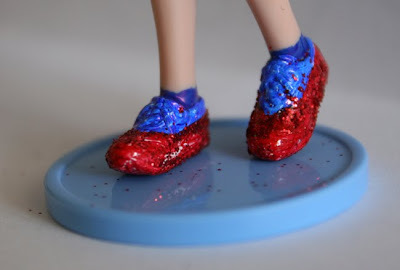 Her shoes and socks were originally white sneakers that we coloured with fine tipped sharpies, then the kids glued and dipped them in red glitter. 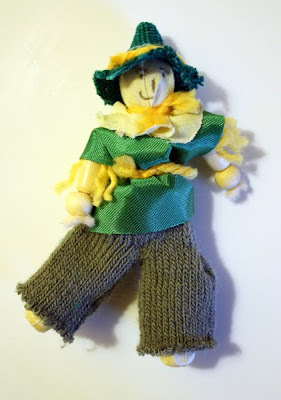 The scarecrow was hacked together from an old project that we'd done, which was making people out of beads. I thought the bead base would work really well for him, because he'd be floppy and hard to stand up like he is in the movie. Glove fingers for trousers and wool tied for straw with a hot glued hat made from a scrap of spare material. The cowardly lion was a bit of a challenge. I tried suggesting a plastic lion toy from the box of animals we have, but that was met with utter dissaproval and I was told that "No, he has to be a people-lion". How do you make a humanoid-lion toy on demand? If only we'd had some Thundercats handy! 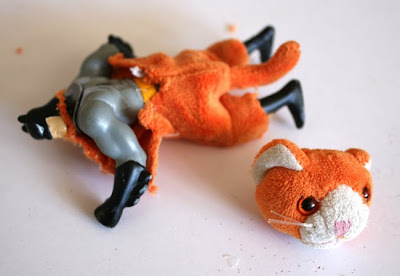 Instead we took the totally freaky approach of forcing Batman into a Hannibal Lecteresque kitty skin suit. Yes, Bruce Wayne is a closet furry. Now this next picture... If this doesn't make you laugh then I don't think I can be your friend. I've been looking at him on and off for two days now and it still makes me giggle. I think it's the way he's standing. The kids think he is just the ticket though. 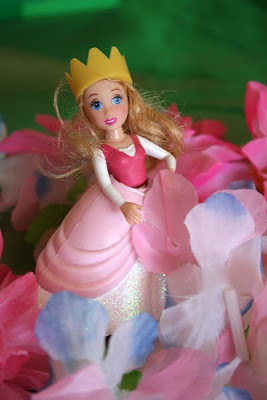 Glinda the good witch was a bit of an afterthought and was just another polly pocket with a carebear crown stuck on her. We've got a cute little Duplo scottie dog that makes a great Toto, but there's no photo of him, because he's gone missing. So, we had the cast sorted. Now we needed the set. 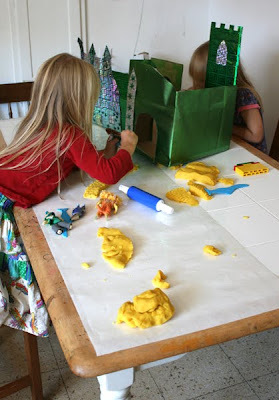 The kids wanted to make the yellow brick road out of playdough, so that was easy. I just made a batch of yellow playdough. I think the bit of this whole escapade that I liked the most is the solution for making it look like it was made from bricks. 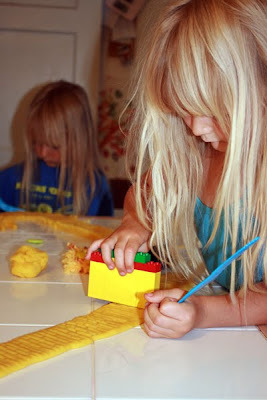 We needed something to imprint a brick pattern into the playdough, so we went looking in the Lego box. My mum saved all my Lego from when I was a kid, and we have these pieces that are meant to be used as walls for house building. 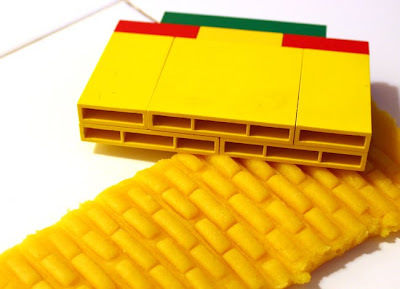 I don't know if they make pieces like this anymore, but we were able to bundle a few of them with other Lego on top to hold them together and they made a great brick stamper. This was where we stopped for the day. 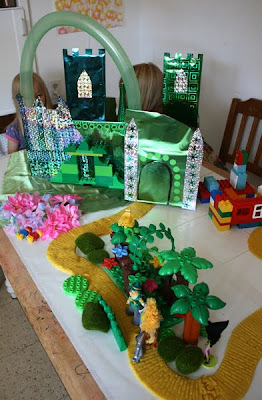 They had already started to draw part of the Emerald City onto a sparkly gift bag, so we carried on with that the next day. 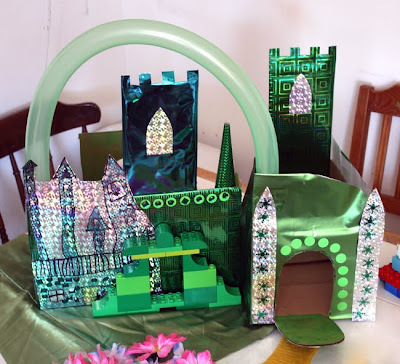 Luckily the kids were only interested in making the Emerald City, so we didn't have to figure out how to make the Munchkin city, or the witch's castle or anything else. As usual I started them off with a base made from stuff in the recycling bin. 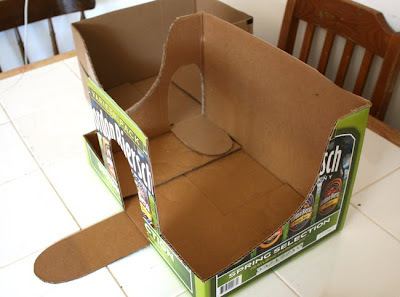 A couple of cardboard boxes with a few strategic exacto knife cuts to them were enough to build onto. We used four gift bags from the Dollar Tree to make it all sparkly and green. They were easy to draw on with Sharpies and put stickers on. There was a bit of painting on the brown box insides too. All afternoon they spent building this on the kitchen table and then playing with it. 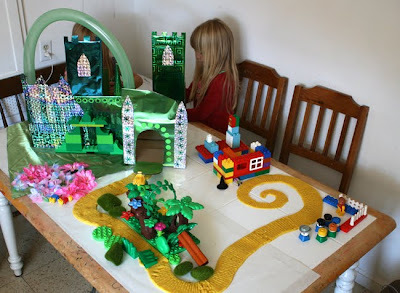 Other random things were added to the set up from around the house, like fake flowers for the field of pink flowers they run across to get to the city, the forest where they meet the cowardly lion, and a Duplo house that the witch could be squished by. Turns out Duplo dudes make really good Munchkins too. I don't know how long the Oz fettish will last around here, but there are things we can keep adding into the story. I think it would be quite cool to make the hot air balloon from the end of the movie, or tape some fake wings on the couple of Duplo monkeys we have. I'm sure the kids will have more ideas too. Here's a shot from the back of the city. Yes, the scarecrow is in bed with a couple of munchkins. This isn't one of the two posts I mentioned in my last post that I was meaning to get up on here. I just got caught up in playing the Oz game with the kids and thought I'd post about it while it was fresh and I knew where the photos were. Do any of you other bloggers do that? Have intensions of posting about things and then get distracted by shiney new games to play? Great job on the playscene! I am very impressed with how the cast turned out! You and your girls are so amazing and inspiring. Filth wizardry continues to be one of my favorite blogs! I love the cast. And yes I was giggling. Loudly. They are all so funny! esp the lion. 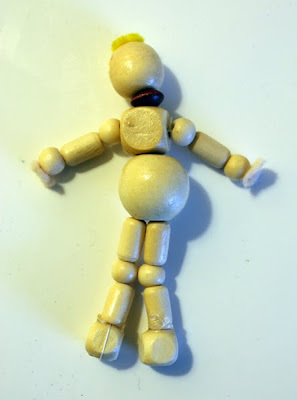 I dont think I have decapitated any soft toys for art projects. I must start! Can I be your friend forever? I laughed all the way through this post. Simply brilliant and so like the sort of thing I did with my daughter when she was young (She's 20 now, lol) I will be doing this sort of thing with future grandchildren, for sure! This is my favorite movie!Well-that and Charlie and the Chocolate Factory.I love your attention to detail.Loved the tin man and the yellow brick road.I would have loved to play with this when I was little! I love these little worlds you create with your kids. I've given up hope that my son will enjoy something like this so all of my playing with tiny figure dreams are resting with my daughter. I think this is really cool. Another amazing idea! I LOVE how you recycle and how creative your characters are! The lion did make me giggle :). it's not just what you do, it's how you get there! I love the way your minds work! Love, love the lion!!! Good golly that's impressive! The witches legs sticking out from under the house is too funny. This post was HILARIOUS! I just about snorted water through my nose when I read about you forcing batman into a Hannibal-like lion suit. This is exactly the type of play that I wish I had had more of as a kid! This is awesome!!! It makes me want to do some sort of DIY play scene. My daughter (5) is all about role-playing and would dig building something like this or the care bear one. I salute you for being so creative (of course) but also for taking that kind of time with your kids and letting them "destroy" things. Wow... this is adorable! I can't believe how you were able to pull together all of those characters with stuff you already had in your house. You're amazing! How do you always manage to outdo yourself?? Your cast of characters are cracking me up! How cute. Did you see the hanging in the old version, or is that urban legend? Can I please be your kid, or at least borrow your creative brain for a bit. Your creations are so amazing. I love seeing what you come up with. wow! how awesome. your girls are sooper lucky to have a mum like you. AWESOME! Y'know, your blog is one of my happy places. I bet you write a book one day. thanks for this post! A) It is hilarious! Laughed out loud at the making of the Cowardly Lion and b)such a great, creative idea for playing, imagining, and creating with kids! Love it! PS - how do you keep your kids from drawing all over themselves with Sharpie? HOLY MOLY is the cute! I would have loved doing this as a child, and I don’t even like the Wizard of Oz! My favorite part is the dolls of course, but the brick pattern and the balloon rainbow are great too! ACK!!!! Can I come live at your house?? I am DYING over this! I love everything you do, but somehow this one just makes me endlessly happy! As for having things to post about, then leaving them behind for newer things to post ---- I do that ALL the time. It's a matter of having too many ideas for one brain to keep track of, I guess! Sigh... back to your Emerald City... I'm dreaming of making one! OH MY GOODNESS! You guys are so creative! I have been following your blog for a bit now and haven't commented, but had to this time. WOW is all I can say. Love the golden brick road and how you changed all the toys to characters. LOVE EM! This is AWESOME! You are so cool. I love the bricked road and all of the figurines, especially the witch and the lion. Ha, a "people lion." The girls are right about that. Keep it up! Another playset masterpiece! You and your girls are so awesome! Keep it up! Of course I smiled when I saw the Cowardly Lion with his super hero stance AKA fake it til you make it, but my biggest grin came when I realized what the Tin Man's hat was made from. Way to think outside the box. You could have found McDonald's Oz toys on eBay and waited for them to arrive, but the immediacy would have dissipated. How much better to teach your girls to make what they are wanting. Yeah for creativity. Hi, Linsey. First of all, thanks for stopping by and for your nice words. 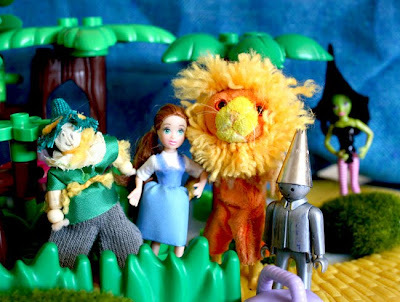 I hope you don't mind but I've mentioned your Wizard of OZ project on my Blog. Thanks again. Love the creativity and workin' with what ya' got approach. The cowardly lion made me laugh so hard... I am laughing just thinking of him. I can't quite put my finger on exactly why it's so funny (something having to do with his "don't mess with me" stance), but THANK YOU for the needed laugh. I love your blog and always look forward to your posts. The Wizard of Oz creation is amazing and what a service you are providing to your children by facilitating their creativity. This is awesome! I can't wait until my 2 year old is big enough to make stuff like this. I am amazed again and again by your creativity and inspired by what you are doing for your own children! I feel bad for poor Batman...too funny!...I do love it all! Also I wanted to say how awesome and brave it is that you change toys into other toys. Coloring on toys with Sharpies? The horror! But then what else are toys for, if not for playing? Thanks for reminding me! This is amazing! I can't wait to be able to do this with my family one day!!!! :) Thank you for sharing! AWESOME. As usual I am wowed. wonderful! my all time favourite movie! how your kids have the patience for this i dont know but im very envious! WOW just doesn't seem to cut it. That is pretty impressive! WOW! just doesn't seem to cut, that is very impressive! You are the Coolest MOM EVER!!!! 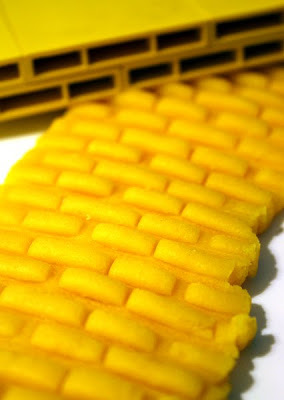 Love the re-made pollys and the yellow brick road -- Genius! Thank you for giving your kids and yourself the permission to explore and to create. What a joy and an inspiration - perhaps others can now dare to color outside the lines a little. Lindsey, you are my idol!!! This is amazing! You have to be the best mommy EVER! *taking notes* I love love love all the characters! And the emerald city! and well, everything! Especially the lion. RAWR. Incredible! It is so cool that you brought the movie to life for them. I just love seeing what you all come up with. SO fun. Wow! This is full of "Epic Win!" I don't see it as a Hannibalesque kitty skin suit... I see it as Batman in a High School mascot costume! HA! GOOOO LIONS!!! Sincerely inspirational. Thank you for sharing! That is the best sort of fun! Making the set, which is so cool, and then all the playing. The best toys we have ever had, have been plastic animals, blocks, cars, and crafty materials - all able to be changed to any current play theme. My daughter made her own car the other day (http://www.papercraftsforchildren.com/2010/07/31/cardboard-construction-car/) and I was so pleased that at 8 she is still into the making and not just the buying. I have just discovered your blog! I want to fast forward 20 years to see what your daughters are doing with their adult lives!I am sure they will be amazing, creative, resourseful, original, motivated..etc etc! I love, love, love this! I am entranced by your Tin Man and all the other dolls. Amazing, but not surprising, coming from you! Just wanted to let you know how much I enjoy your site, and that is has totally transformed what I do with my kids. Looking very forward to seeing what the rest of your summer holds! I have given you a shout out in my blog this week! love, love, love it! the photos of your witch and scarecrow give me the biggest smile!!!! What a great blog you have. Absolutely amazing idea! My kids would FLIP! You will receive an award on my blog tomorrow! 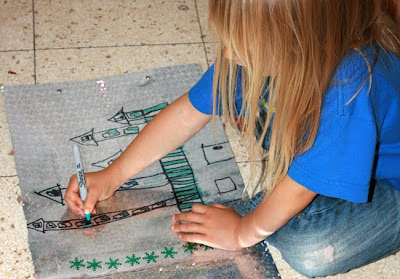 I love projects were kids use their imagination and parents spend time with their kids. oh, oh, oh. the yellow brick road. i love it. I absolutely love this playset! I've featured your tutorial & set on my blog Cross My Hooks! We loved this so much that we made our own and dedicated it to you and your sweet girls!! Thank you for such wonderful inspiration and for helping us create such fun memories -- my girls LOVE this!! 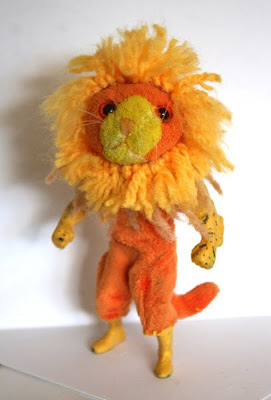 I just discovered your blog and I was laughing so hard when I saw the lion. So hilarious! Your ideas are so very inspiring and creative. I can't wait to do stuff like this with my little one when he's older. He's almost two- I don't think I'll be giving him a permanent marker anytime soon. omg that lion. I laughed until i bawled, and then I laughed some more! i love batman so much, and seeing him being violated into a lion suit cracked me up, and then i scrolled down and the way he is standing with his little lion face staring right at you? gold. freaking gold. Utterly enchanting! Wow, I wish I had seen this several years ago ... We made a 3D mural while we read the story and I KNOW we would have loved making this! Thanks for all your great ideas - and yes, I did LOL when I saw the lion - too funny for words! I'm a first time visitor to your blog and I just wanted to let you know that it made me so happy this morning! 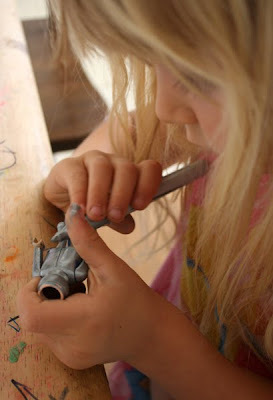 I loved seeing the wonderful, creative and imaginative things you are doing with your kids. I wish more people approached parenting like you! i haven't had a belly-aching giggle for a while! cheers for that! I want to come over and play! I was obsesses with that movie as a kid. LOVE IT. The cast is terrific. Lion is definitely giggle worthy. Ok, I'm giggling about the lion/batman. That was the best! This is so wonderful! Can I come and be your kid for a while? I just posted your picture of Batman becoming the Lion on my tumblr, with a link to you and a quote. If that falls under things you'd rather not be done, please let me know and I'll remove it at once. I think it's hilarious! Thanks for sharing it. This is fantastic. 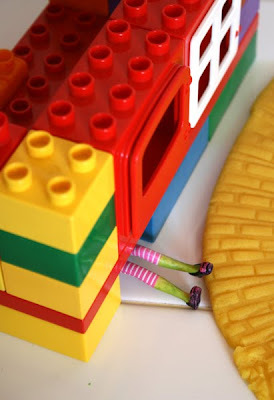 Your kids will remember these projects throughout their life for sure! Building complete and quality playsets from scratch!! Beautiful. They will also learn something valuable here: you don't have to buy everything ready, rather do them yourself (and they'll be even better!! ).